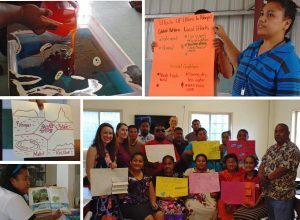 After two years of Pohnpei Teachers Learning Community (PTLC) focus on self-development and building their own capacities as climate education teachers, they turned to sharing their knowledge and skills with other colleagues, school leaders, and pre-service teachers at the College of Micronesia during school year 2016-2017. “In the three years of working with the members of PTLC, I have seen them grow and develop into more self-confident teachers!”, said a PREL staff on the ground. This is proven by selection of three of the PTLC members as Teacher of the Year of their schools and one of them being further selected as 2017 Pohnpei Teacher of the Year. Taking a break from outreaches, the PTLC turned to gaining deeper knowledge by participating in a two-day workshop learning about Climate Variability and the effects of El Niño–Southern Oscillation (ENSO) in Pohnpei lead by graduate students from the University of Washington’s Integrative Graduate Education and Research Traineeship (IGERT). After the IGERT workshop, they spent March 27-30 immersed in PCEP resources and place-based education. Topics covered during the week included mapping, sharing of lessons learned, brainstorming of different teaching strategies and activities to incorporate the many resources. Of particular interest to the team was the collecting of soil samples, pinpointing where soil was collected in their own school maps, and then analyzing and comparing the samples collected from different parts of the island as well as linking them to math lessons on measuring the different layers shown in their bottles. Highlight of the week was the presentation of ‘gifts’ (in the form of classroom tools) to the team, thanks very much to Corrin Barros and PCEP!